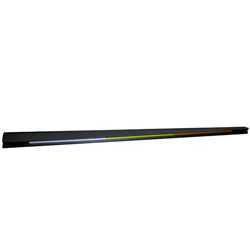 The 80305 Balance Beam for Rats consists of a ledged tapered beam that can be supported between any open space. The test involves scoring foot faults (slips) while the beam is traversed. The beam is marked so that the location of the fault can be noted for each limb within each of three color coded 45 cm bins of increasing difficulty. A 15 cm loading and unloading section is provided at the beginning and end of beam which are not scored. A dark box or home cage may be placed at the end of the beam to act as a reinforcer. A 2 cm ledge runs the length of the beam on both sides providing a crutch for the animal to use when there is a deficit. Without the ledge crutch, the animal would be forced to alter its posture and weight distribution so that it relies on the non-impaired limbs. Such compensatory behaviors mask the deficit and make it difficult to evaluate brain repair mechanisms. Reference: Disentangling multiple types of recovery from brain injury, T. Schallert, M.T. Woodlee, S.M. Fleming, Institute for Neuroscience UT - Austin. In Pharmacology of Cerebral Ischemia, J. Krieglstein, S. Klumpp (Eds), pp 201-215.